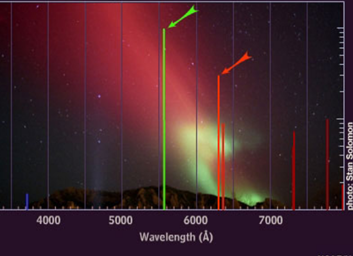 An aurora is the emission of light caused by collisions of highly energetic, charged particles originating from the plasma emitted by the sun (solar wind) with the gases in the part of the Earth’s atmosphere called the thermosphere. 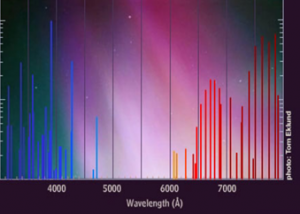 Different gases emit different frequencies of electromagnetic waves (or colours of light), thus the colours visible during auroral activity are determined by the chemical composition of the atmosphere at the heights where the collisions occur. 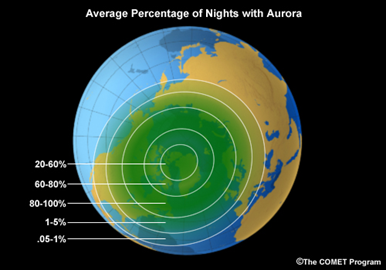 Between 100 and 200 km altitude, where the majority of auroras occur, the main constituents of the atmosphere are atomic oxygen (O) and molecular nitrogen (N2), with the percentages of each gas differing depending on the altitude. Atomic oxygen, which is the most abundant at heights above 150 km, emits mostly green and red colours when it collides with the charged particles. Molecular nitrogen, which is more abundant at altitudes below 150 km, is responsible for emissions of red, blue and violet colours. Moreover, interactions between atoms of oxygen and nitrogen enhance the green colour emissions. 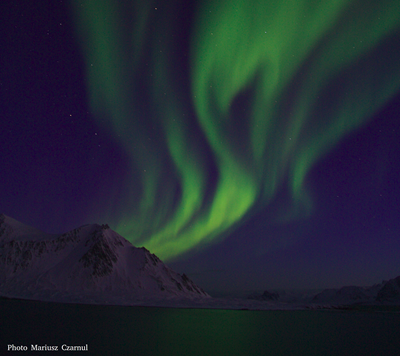 As the charged particles are injected into the Earth’s magnetosphere, they are guided by the geomagnetic field lines into the bands called the auroral ovals, concentrated around the North and South Magnetic Poles.